Why are some components missing or partially obscured in my apps in MATLAB R2014b? I have a figure which has a uipanel and an axes within the uipanel. In MATLAB R2014a, the figure appears as expected, but in MATLAB R2014b, the axis is no longer visible. I can only see the uipanel. Why is this so? Axes, uicontrols or uitables might appear to be missing in the new graphics system because they are obscured by other components. In R2014a and earlier, the order of components listed in the Children property matches the order in which they are created. However, this order does not necessarily match the front-to-back positioning (or the stacking order) of the components on the screen. In R2014a and earlier, uicontrols always display on top of uipanels and uibuttongroups. Previous releases also allow an axes to display on top of a uipanel without being a child of the uipanel. Relative positioning is not sufficient to display an axes, uicontrol, or uitable on top of a uipanel or uibuttongroup. To place a component on top of another, set its Parent property to be the component you want to appear beneath it. Uipanels and uibuttongroups have the same stacking order behavior on the screen as uicontrols and uitables. The new behavior reflects changes to MATLAB® that provide more consistent behavior. This code creates a figure with a top panel containing an axes and a bottom panel containing a push button and pop-up menu. Running the code in R2014a and earlier produces the figure on the left. However, running this function in the new graphics system produces the figure on the right. To ensure there are no components hidden behind containers, set the Parent property of each component to make it a child of the container. For example, the following code restores the appearance of the original GUI. Fix the layout in GUIDE. Fix the child order of the components. To fix the layout in GUIDE, open the fig-file in GUIDE and use the Send to back option to rearrange the stacking. 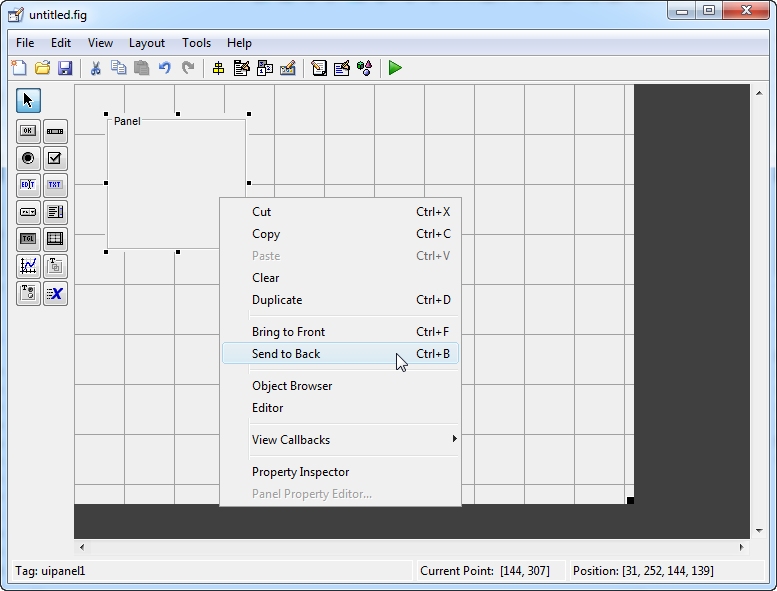 For example, to move the panel in this GUI behind all other components, right-click the panel and select Send to back. To fix the child order of the components, so that the GUI displays them as they appear in GUIDE, select View > Object Browser. 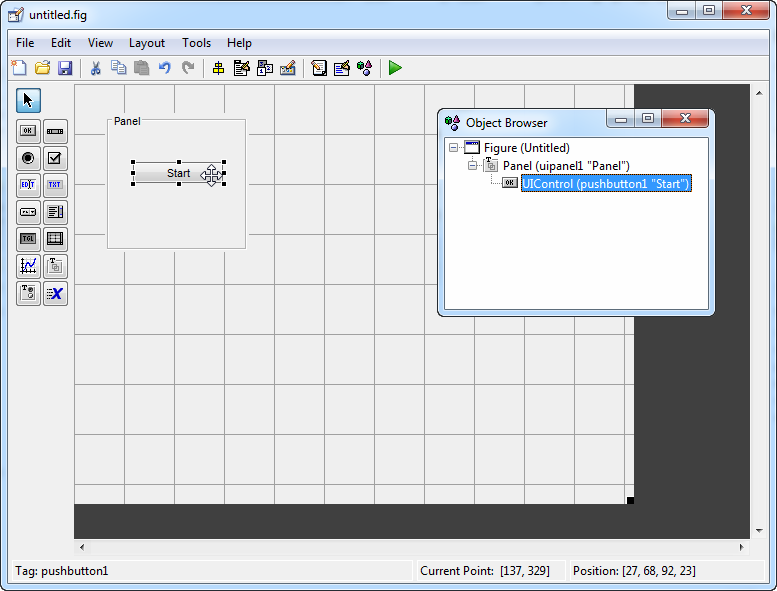 Then, select a component and move it slightly within the panel or button group. For example, selecting and moving this Start button slightly while it is on the panel makes it a child of the panel. Child components display on top of their parent, so this Start button displays on top of the panel when the GUI runs. The Missing Graphics Finder app can help you find graphics objects that are obscured by uipanels. This app is available from http://www.mathworks.com/matlabcentral/fileexchange/46581-r2014b-graphics-update-tools.